Children’s mind is utmost sensitive. It is said that if a child is facing situations like constant brawls and fights around, their mind gets the same damage as a collateral damage is faced in a war. Such a story of our little angel, V Sumathi. The story of her life doesn’t reveal places and names. Also, the sensitive content requires user discretion. V Sumathi joined our Joy Home Orphanage in the year 2014. Belonged to a lower middle-class family. Her Family was a complete dysfunctional. Her mother was a victim of House arrest and Domestic Violence. Her Dad was a drunkard who use to spend all his money on liquor. V Sumathi was not only underweight but also a patient of Malnutrition and also never been to school. Facing all these odds their lives were a complete mess. They barely used to have one meal a day considering their income so low, the children’s school was the last item on their Checklist. V Sumathi has been able to gain a proportion of required weight and also excels in school. She is very active in school and extracurricular activities. No one knows what runs inside of a small child. Make sure you don’t let any child suffer like this. If you find nearby please reach us immediately. 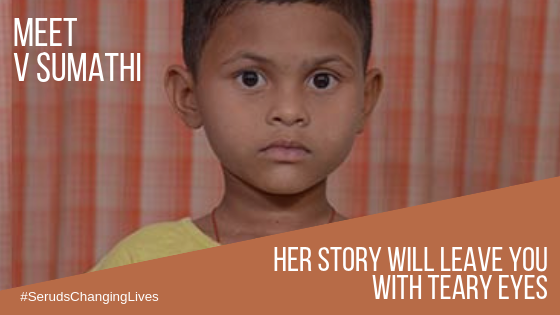 Help children like V Sumathi and many other with Food and other daily requirements. Click to Donate. All it takes a few clicks and pure heart to help someone.